Dr. Kathleen Sheppard, associate professor of history and political science at Missouri S&T, wondered why there was so little mention of the scholarly work of Dr. Caroline Ransom Williams, America’s first university-trained female Egyptologist, in archaeology’s published history. After all, Ransom Williams was a former student and longtime colleague of Dr. James Henry Breasted, the first American Egyptologist and founder of the Oriental Institute of the University of Chicago. To find the answer, Sheppard spent two years researching, transcribing and editing 240 letters between Ransom Williams and Breasted that are archived at the Oriental Institute. 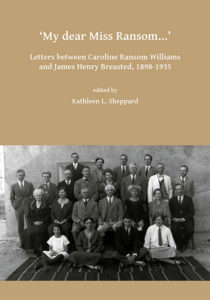 This collection of correspondence is now published in the first book-length discussion of Ransom William’s life and career, “My dear Miss Ransom: Letters between Caroline Ransom Williams and James Henry Breasted, 1898 – 1935,” edited by Sheppard and released by Archaeopress Publishing Ltd. in March 2018. Sheppard’s research focuses on the history of Egyptology in the U.S. and in the U.K. and especially women’s roles in the discipline. She finds that telling the life stories of women in Egyptology is crucial to fully understanding the whole story of the discipline. Ransom Williams was born into a prominent family in Toledo, Ohio, in 1872. She earned a bachelor’s degree in art history from Mount Holyoke Seminary in 1896. After teaching at Lake Erie Seminary for a year, she went on to study with Breasted at the University of Chicago where she completed a master’s degree in classical archaeology and Egyptology and in 1905 became the first woman in the U.S. to earn a Ph.D. in the history of art and Egyptology. In between graduate degrees, she was awarded a prestigious assistantship at the Berlin Museum’s Egyptian department, where she worked for three years. 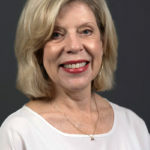 Ransom Williams’ other appointments included assistant professor and chair in the history of art and classical archaeology department at Bryn Mawr College in Pennsylvania. “Her most important work was arguably done as the assistant curator at the department of Egyptian Art at the Metropolitan Museum of Art (MMA) in New York City, where she was in charge of one of the fastest-growing and leading collections of Egyptian art and artifacts in the U.S., if not the world,” says Sheppard. After marrying in 1916 at age 44 and relocating from New York to Toledo, Ransom Williams’ lifestyle changed with the domestic duties of marriage and in caring for her aging mother, but she continued working on Egyptological research for the MMA, New York Historical Society, Oriental Institute and several art museums in her geographic area, while teaching on and off at the University of Michigan.